Literary experimentation ever so frequently falls into the kind of anarchic or boutique variety that may not always portray a methodological soundness. We might think here instead of more structured experiments, such as those of e.e. cummings or bp Nichol where there is a guiding element not found among other authors who, in the face of reactive anxiety in failing to classify their own work under a pre-specified category, make use of the word "experimental" in such a way that it does not always show fidelity to what an experiment entails. Generally, an experiment will begin with a methodology and have some means by which its results can be verified or falsified. Such an empirical frame may not be entirely suitable to the subjective demands and products of literature. However, one of the most important aspects of any experiment is its possibility of failure, and that a failed result is still technically a result that functions as a reference for others who may wish to follow the same methodology or focus. In addition, literary experiment - aligned in part by the postmodern or poststructuralist turn - can sometimes be too hasty in the construction of neologisms that give the experiment a kind of vogue term that others can rally around and wield for the the kind of cafe klatch insider baseball among literary elites, the kind of passwords that function for admission into literary knowledge. When the flurry of neologisms do not indicate a precise program or method, or otherwise simply rename old practices, we are right to be suspicious. However, in the edited volume by Henry Whittlesey, we are presented with a neologism linked to a purposive method and program, what he and the authors call transposition. 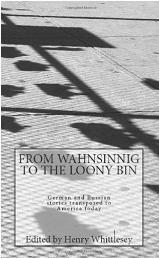 This is clearly defined in terms of its scope and program in the editor's introduction as being an "inversion of adapatation" where the approach is to re-compose (in this case Russian and German) short stories in such a way where their historically-based circumstances are rendered compatible with the modern day. At first blush, it does seem to resemble adaptation, but it is the differences that distinguish this practice as not being an adaptation even if older stories are "adapted" to the present. When we think of modern adaptations, we can draw from numerous examples such as the film Apocalypse Now as a partial adaptation of Conrad's Heart of Darkness set in Vietnam rather than the African Congo, or Will Self's Dorian as the modern day adaptation of Oscar Wilde's Portrait of Dorian Gray. Such adaptations are given enough creative license to be freeform experiments where there may only be a passing resemblance to the original, such as the repurposing of characters or situations adapted to the current context, and possibly to allow for additional creative aspects in the plot. However, transposition involves a much more rigid method of showing especial fidelity to the actual form and the words of the original, making very modest changes so that, for example, gold is transposed as dollars, or the marketplace is transposed as a megamall. The attention to form is also explicit in the actual phrases that are transposed into the present vernacular. There are no substantial plot changes and no freewheeling speculations of extending that plot as one would find in fan fiction. From a philosophical perspective, I might have issue with the idea of form in this context (I am, in many ways, a committed anti-Platonist, and see form in the Deleuzian sense of being a complementary articulation along with expression emerging out of the chaosmos of unformed matters). However, a literary "form" differs from a philosophical form that contends with eternal ideas, although in the case of transposition it is the eternal story as concretely manifested in the original. We might take issue with the idea of "original" as well, if not also the unavoidable changes that result from any act of translation which may in fact create a new text, but such points are mostly academic in nature and do not impair the enjoyment or the rigour of this experimental approach. I am tempted to characterize transposition as not a concept with a method, but as a method with conceptual implications. This, I think, avoids the kind of "largesse" of so many competing "theories of literature" that are created (generally on flimsy or gimmicky pretenses). This is not to say that transposition does not imply a range of questions on the order of "what is x? ", which thus aligns it with a kind of ontological consideration. Beyond this, though, transposition asks "what is x in conditional and multifactorial circumstances a, b, and c?" Where it differs considerably from other such "adaptation" based renderings. Transposition thus far does not cross media genres; that is, a short story doesn't suddenly become a film or a painting (such schemes are far more aligned with adaptation and representationalism). Of course, this brings up the nagging question of "what of those works we want to transpose into a particular media that did not have access to that media at that time?" That's the blockage, right? It's an old tune: how does one adapt Homer's oral tales into text, and what does one lose in the process of translating across media genres? Should transposition restrict itself to the one-to-one direct correspondence of transposing from text to text? If we wish to be true to the stated aims and method of transposition, it might have to be the case. Here is a question: can transposition work in reverse, or is it an irreversible arrow of time (like dropping an egg)? That is, can it be somewhat Newtonian, recalling that according to the classical view of physics, all processes, like the orbit of planets around a star, have rules that make complete sense even if you run them backwards? So, "transposing" this to the transposition context, is it possible to transpose a contemporary work to the past? Could someone transpose Irvine Welsh to, say, to the time and place of the Frankish kingdom? I suppose that would take intimate familiarity with the details of the past, and we all know history is fairly subjective once you get beyond the unrevealing objective facts of dates and places. But then, I suppose, the same critique could be leveled at transposition: what makes us think that we "understand" the present time in which we live? Was it not Foucault who reminds us that we cannot periodize history or have a full understanding of it until it has past, and even then it would mean access to all documents that were written (and not!)? Of course, this might be unfair because then we would need to insist on some ideal form for transposition involving some kind of omniscient figure - and so we need to acknowledge any method's limitations. In addition, we can charitably assume that the transposition authors have direct access to the common stock of assumptions in the perception of our present time, at least on the basis of a shared vernacular and the events that populate this present time to which a majority of us are familiar. From a generative and continuity standpoint, not only is transposition in an ideal position to extend its gains by transposing works outside of the German and Russian literary past, but of any culture, and it could function equally well in transposing American works into other cultures as well, if not from its own culture (for example, what prevents transposition from taking on Harriet Beecher Stowe or the incendiary sermons of Cotton Mather?). Moreover, anything that is transposed today would, given the circumstances of the future, require further transposition to smooth out the historical incompatibilities. It is possible that, in a hundred years (assuming we make it that long), dollars and malls will be as foreign to a general audience as pfennigs and tupperware parties are to us today. In one sense, it can be very difficult to attribute the "authors" of the transposition project authors in the conventional sense. They operate more as midwives of the text, or like translators that rely on a set of stringent rules for reconstructing the content in a transposed way. As an experiment, its solid methodology has a repeatability and even an applicable scope that could not be exhausted by its inventors. Moreover, it has the distinct advantage of appealing to two readerships: the one that has direct knowledge of the original and wish to see how it has been modified to the present context, and the other a readership who may have never read or even heard of the originals being introduced to the literary imagination of the past without the obstacles of historical incompatibility. I am reminded of a series I read in childhood entitled Classics Illustrated where the canonical works of literature were modified in content and media to present a comic-book truncated version of the original in such a way that it could be understood by a contemporary young audience. The volume contains, for those who are familiar with the literary canon, transposed versions of Gogol's "The Nose" and "The Night Before Christmas," Pushkin's "Activists" and "Criminals in Love," and E.T.A Hoffmann's "Gambler's Luck" and "The Sandman." In essence, the transposition of these stories moves that one critical step beyond mere translation, and thus embraces the preservation of narrative form in a content situation more readily recognizable by a present audience without sacrificing the literary invention and meaning of the original authors.